Philadelphia, May 8, 2018 – High levels of cytoskeleton-associated protein 4 (CKAP4) have been identified in the blood of patients with lung cancer. In a novel study in The American Journal of Pathology investigators found that CKAP4 levels were significantly higher in patients with lung cancer than in healthy individuals. They further determined that CKAP4 levels are already elevated in the blood of patients with stage I disease, making it a potential noninvasive diagnostic marker that could change current practices in the diagnosis and treatment of some types of lung cancer, including non-small-cell lung cancer and squamous cell carcinoma, and improve patient outcomes. Lung cancer is the leading cause of cancer deaths in both men and women in the United States and worldwide. The disease is associated with a poor prognosis because most lung cancers are only diagnosed at an advanced stage. "The identification of patients at an early stage of cancer when it can be treated surgically is extremely important to improve prognosis," explained Yuichi Sato, PhD, Department of Molecular Diagnostics, Kitasato University School of Allied Health Sciences, Sagamihara, Kanagawa, Japan, who led the study. "We need better biomarkers for early diagnosis." Current biomarkers for lung cancer include carcinoma embryonic antigen (CEA), sialyl Lewis X antigen (SLX), squamous cell carcinoma (SCC) antigen, and cytokeratin fragment (CYFRA) 21-1, but these are not sensitive enough to detect tumors early, according to co-investigator Ryo Nagashio, PhD, from the Kitasato University School of Allied Health Sciences. "The results of our study provide evidence that the CKAP4 protein may be a novel early sero-diagnostic marker for lung cancer." Researchers performed reverse-phase protein array analysis using a monoclonal antibody designated as KU-Lu-1 antibody on the blood of 271 lung cancer patients and 100 healthy individuals. KU-Lu-1 reacted only with tumor cells and tumor stromal fibroblasts in lung cancer tissues and not with normal lung tissues. 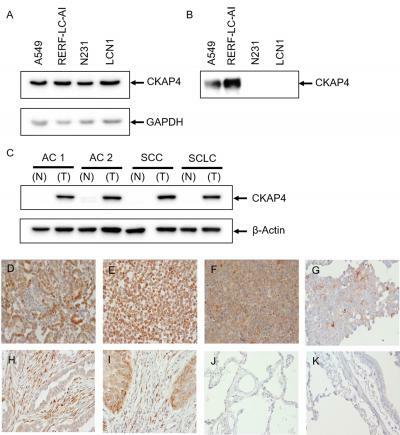 Using immunoprecipitation and mass spectrometry, they confirmed that the KU-Lu-1 antibody recognized CKAP4 in lung cancer cells and tissues, and its secretion into the culture supernatant was also confirmed. In addition, a validation set consisting of samples from 100 patients with lung cancer and 38 healthy controls was also studied. CKAP4 was recently identified as a receptor of Dickkopf1 (DKK1). Expressions of DKK1 and CKAP4 were frequently observed in tumor lesions of human pancreatic and lung cancers, and the simultaneous expression of both proteins in tumor tissues was inversely correlated with prognosis and relapse-free survival. Across disease stages I-IV, the sensitivities of serum CEA, CYFRA, and SCCA are reported with 30 to 52, 17 to 82, and 24 to 39 percent, respectively. In this study, the sensitivity of serum CKAP4 was 81 percent in the training set and 69 percent in the validation set. These rates are higher than those of the current sero-diagnostic markers. Furthermore, the sensitivity of serum CKAP4 was also high even in stage I non-small-cell lung cancer and squamous cell carcinoma. "The use of CKAP4 as a biomarker could change current practices regarding the treatment of lung cancer patients, and the diagnostic accuracies may be markedly improved by the combination of CKAP4 and conventional markers," concluded Dr. Sato. Our vulnerable nervous system: What affects its protective sheaths?